When changing to a new phone you may need to sync many data from the old one to the new one. Today we are going to share you some methods to transfer messages to Samsung Galaxy S9. 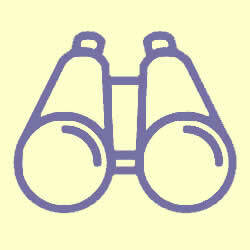 We also provide a specific video tutorial for you to know more in detailed. You can choose the most convenient and fastest way to import messages to your new phone. Let's start to learn these methods together. 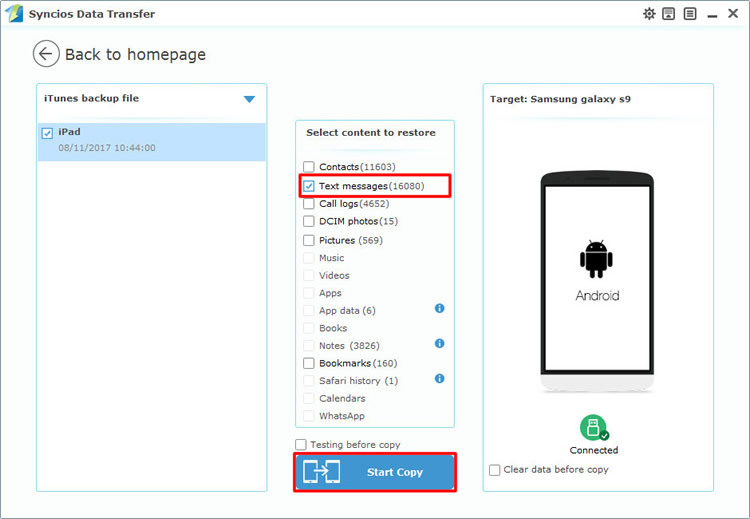 You can transfer the selected messages to Samsung Galaxy S9 of your willing. Meanwhile, you can also transfer different types of data to Samsung Galaxy S9 with the help of Syncios Manager. 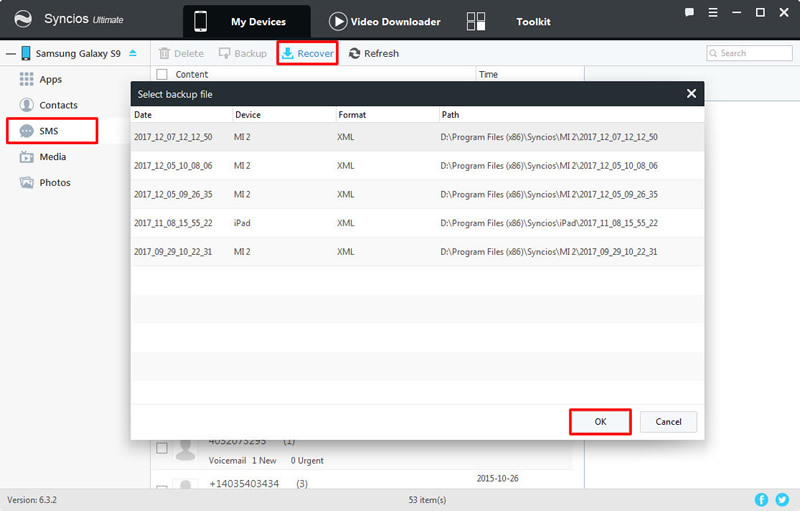 Launch Syncios Manager and connect your Samsung Galaxy S9 to computer as your first step. Then Select 'SMS' options on the left panel. All the messages of your Samsung Galaxy S9 will show on the screen. Then click 'Recover' button on the menu bar and select the message backups you've made before. Finally, Click 'OK' to launch the transferring process. 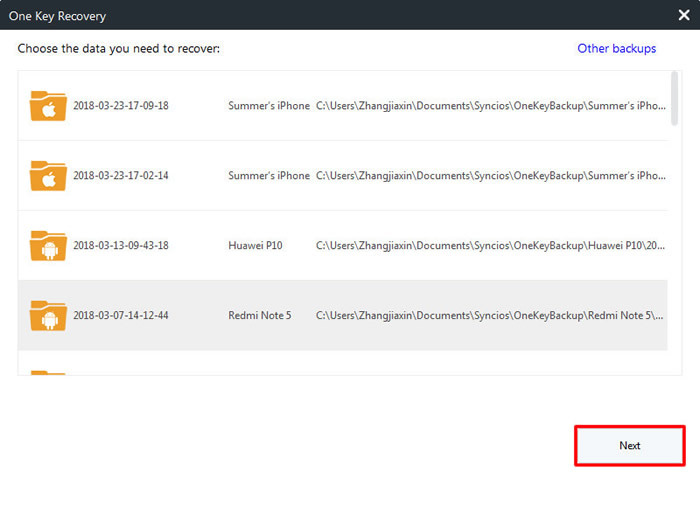 Syncios Manager also includes the '1-Click Restore' function which can let you restore backups to your Samsung Galaxy S9. Now go to 'Toolkit' and select '1-Click Restore' function. The backups you've made with the function of '1-Click Backup' will all show on the screen. Select the backups which include the message -- 'SMS' content and click 'Next'. 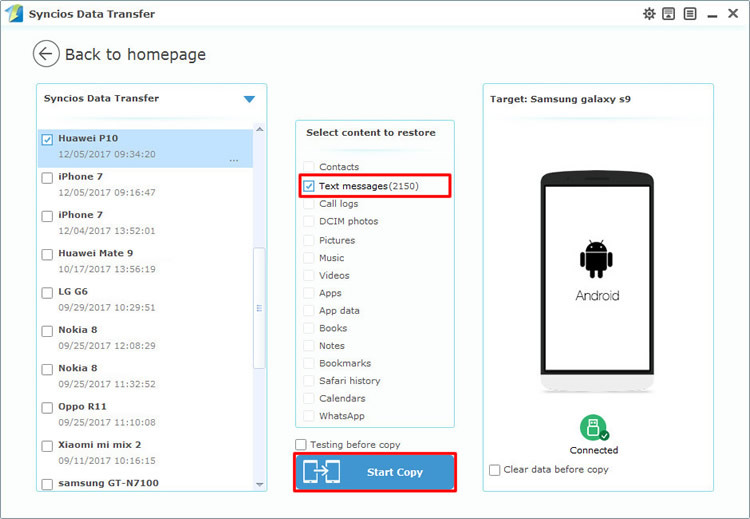 Select message contents and click 'Start Recover' to launch the transferring process. If you want to restore messages from your iTunes or iCloud, then we highly recommend you to use Syncios Data Transfer which can satisfied you much. Syncios Data Transfer also support to transfer multiple types of data within phones. 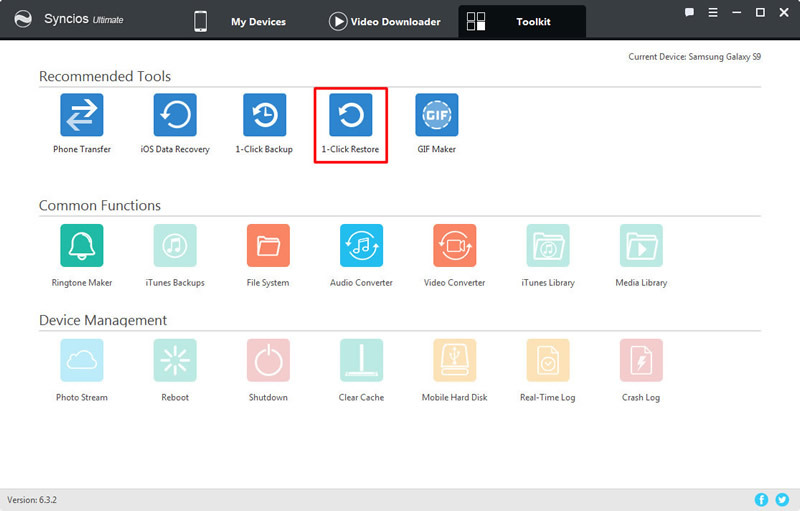 Restore messages from Syncios backups: Launch Syncios Data Transfer and select 'Restore from PC' option, then connect your Samsung Galaxy S9 to computer. Once it synchronized successfully, all backups you have made before were listed on the left side by the timeline. If you backed up your messages before, a checkbox will appeared in front of 'Text messages'. 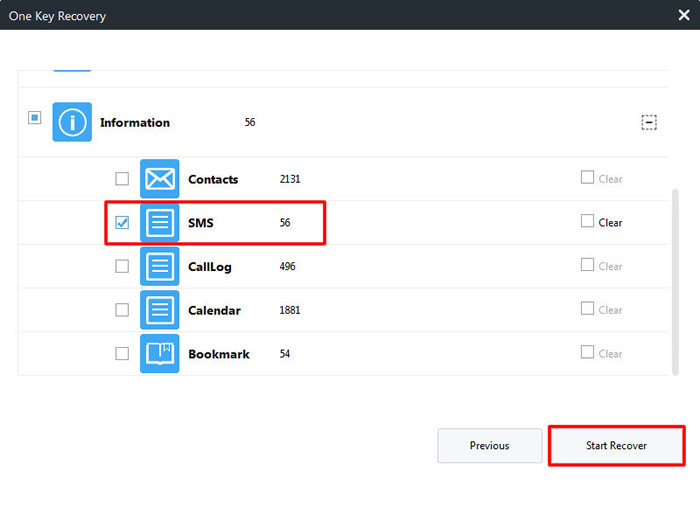 Select the messages backups you've made before and simply click 'Start Copy' to launch the transferring process. Restore messages from iTunes backups: Launch Syncios Data Transfer and select 'from iTunes backups' option, then connect your Samsung Galaxy S9 to computer. If you ever make any iTunes backups before, the backups you have made before will list on the left side. Then do the same operations as 'Restore messages from Syncios backups'. 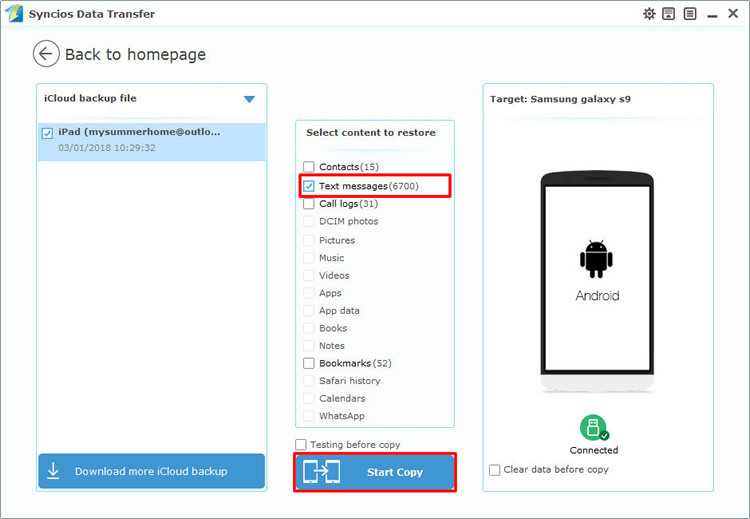 Restore messages from iCloud backups: Launch Syncios Data Transfer and select 'Restore from iCloud' option, then connect your Samsung Galaxy S9 to computer. You need to download your iCloud backups first. Click 'Download more iCloud backup' and enter your Apple ID to download the certain iCloud backups. Then do the same operations as 'Restore messages from Syncios backups'.